'Tsingy de Bemaraha Strict Nature Reserve' in Western Madagascar is a unique region of amazingly jagged landscape, where needle-shaped limestone formations known as 'Tsingy' rise to heights ranging from few metres to several hundred metres. The razor-sharp karst pinnacles were created due to erosion of limestone cliff by heavy tropical rain. Spread over an area of about 600 Sq. Kms. (230 Sq. 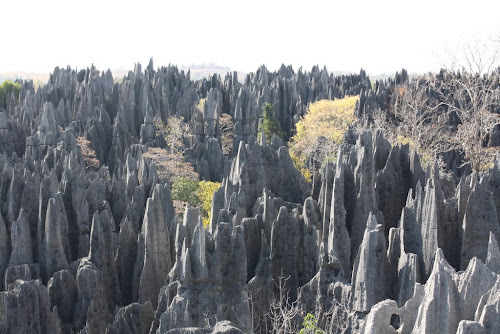 miles) along the River Manambolo, it is considered to be World's largest stone forest. "The unusual formations here are a type of karst system, a landscape formed from porous limestone that was dissolved, scoured, and shaped by water. The exact processes that carved such an otherworldly stonescape are complex and rare; only a few similar karst formations exist outside Madagascar. Researchers believe that groundwater infiltrated the great limestone beds and began to dissolve them along joints and faults, creating caves and tunnels. The cavities grew, and eventually their roofs collapsed along the same joints, creating line-straight canyons called grikes, up to 400 feet deep and edged by spires of standing rock. Some grikes are so tight that a human traveler has difficulty passing through them; others are as wide as an avenue." The 'Tsingy' which in English translates to 'where one cannot walk' has remained largely unexplored and isolated from most of the World due to these incredibly sharp limestone formations which can easily cut through shoes and flesh. Some walkways and bridges have been provided over smaller pinnacles (known as 'Petits Tsingy') for visitors. The larger pinnacles called 'Grand Tsingy' are accessible only to climbers using ropes and climbing equipment. Although the region is inhospitable for humans and most of the animals yet it is home to 11 species of lemur, 100 types of bird and 45 kinds of reptile. The area is listed as a UNESCO World Heritage Site.